When you think of St. Augustine, what goes through your mind? Do you think of the St. Augustine lighthouse or the nearby coquina stone forts? The Nation’s Oldest City is home to so many quintessential sites that represent its long, 400-year history, and no stay is complete without seeing at least one. During your stay at Agustin Inn, visit some of these iconic St. Augustine landmarks! The easiest way to find all the best attractions in town (including St. Augustine landmarks) is to access our free Vacation Guide! It includes our recommendations for the best of the best when it comes to restaurants, shops, and museums in the Nation’s Oldest City. There are two main forts in St. Augustine: Castillo de San Marcos, built in 1695, and Fort Matanzas, built in 1742. Both served as protection to the city and are now open as national monuments. Each site features musket demonstrations and is open every day of the year except Thanksgiving and Christmas. The St. Augustine Lighthouse, built in 1876, stands 165 feet above sea level. The museum offers many different tours, including the famous Sunset Moonrise Tour. This once-a-month event allows visitors to watch the sunset and moonrise from the best viewpoint in the city. The Dark of the Moon Tour is for the bravest visitors. You’ll explore the grounds on your very own ghost hunt with special equipment to see if you can find any of the city’s most infamous former residents. It may seem strange to include an entire street on a list of landmarks, but once you tour it, it’ll make sense! This pedestrian-only thoroughfare extends from the City Gates to the Plaza de la Constitución. Some of the best shops, restaurants, and attractions in town line this landmark. You could easily spend a great afternoon exploring the many side streets and quaint stores in the area. 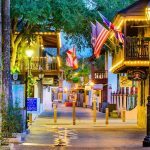 For a full list of our favorite spots, check out our blog on St. George Street in St. Augustine! If you treat yourself to a St. Augustine sightseeing cruise during your stay, you may spot an enormous cross that overlooks the city. This cross is part of the Mission of Nombre de Dios, and it and the mission date back to St. Augustine’s founding by Spanish settlers. Today, visitors can tour the museums and the grounds, as well as visit the gift shop. If you’re looking for an easy way to visit these sites, purchase a ticket to the Old Town Trolley Tour! This train stops at 23 of the city’s most famous spots, including the ones on this list. 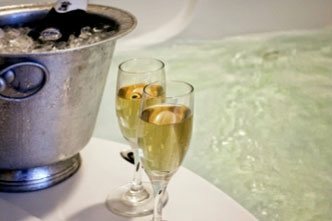 If you book your stay at Agustin Inn, you’ll have the option to purchase a three-day pass to the tour! 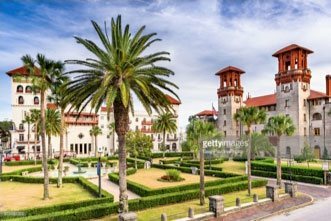 If you want to visit these St. Augustine landmarks during your next getaway, there’s no better place to stay than Agustin Inn. 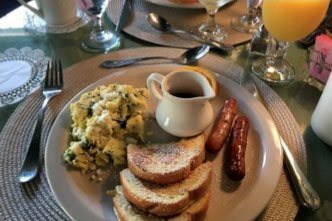 Our historic bed and breakfast is nestled off of St. George Street, just a short walk from the best attractions in St. Augustine. You won’t believe how easy it is to explore the town, right from our front door! Plus, there’s no better way to start your day than with our delicious daily breakfast. 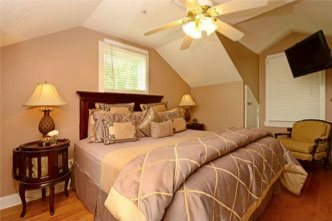 Browse our comfortable guest rooms and start planning your next getaway.